Teresa is the Chairperson of SKS Board. She has handled partnerships with credible NGOs and designed program on Fighting Discrimination and HIV/AIDS. 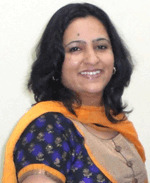 She has a Masters Degree in Development Studies from School of Oriental and African Studies, UK and Masters in Social Work from Tata Institute of Social Sciences and a Bachelors Degree in Sociology from Hindu College.